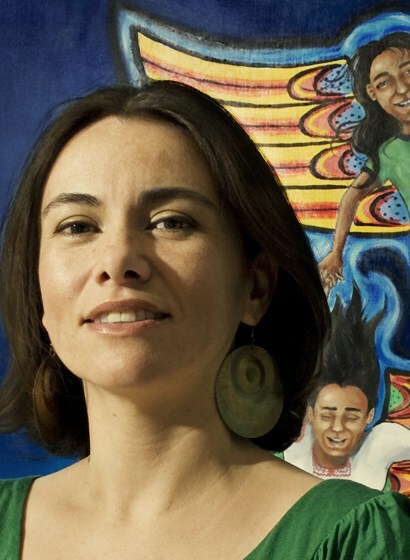 Poet Olga Garcia, author of Falling Angels: Cuentos y Poemas and the chapbook Lovely Little Creatures, blogs about her experience facilitating a P&W-supported workshop with young Latina women. In July of 2008, I was invited by Calaca Press  to facilitate a two-day workshop in San Ysidro with eight young Latina women. The goal was to nurture these emerging writers via an intense writing workshop, publication, and public reading. The participants ranged in age from eighteen to thirty-three years old, and came from a variety of communities in Southern California—San Diego, Los Angeles, Ontario, and Montclair. We gathered at The Front , a San Ysidro art gallery exhibiting political prints. Zapatistas and workers in struggle from around the world peered at us from the gallery walls as we began our journey. Our objective: connect with our bodies and excavate poems buried therein. On that Saturday and Sunday, for fours hours each day, we explored different concepts of the body. We read Lucille Clifton’s “Hips,” Elba R. Sánchez’s “Me Siento Continente,” Michelle Tea’s rant to America, “The Beautiful.” Yusef Komunyakaa sang praises to the flesh in his sensational poem, “Anodyne.” tatiana de la tierra gave us “Visions of Colombia.” And, Sandra C. Muñoz gave us a body manifesto entitled, “For My Sister Who Thinks I'm Unhappy Because I like her Don’t Wear a Size Six.” The words of these writers were our guides, providing constant inspiration and great poetic models. Aside from reading and writing, we also played. Using collage materials from recycled magazines and newspapers, we created poster-sized body maps. These body maps served as springboards into writing exercises, allowing us to venture into poems about flesh, memory, and body scars. Sara Eslava, one of the participants, for example, wrote a celebratory ode to her curves, while Patricia Beltrán birthed a prose piece about a lover who failed to see the beauty in her cesarean scar. In the weeks following, I worked with Calaca Press to compile and edit a small chapbook consisting of the women’s strongest work produced during the workshop. The women were encouraged to revise titles, flesh out gaps, and polish images. All of the women proved themselves extremely committed to the process and to improving their craft. Being a part of this unique project and working so closely with these women gave me more than they will ever know. They gifted me with the opportunity to be part of their evolution as writers, which has fueled my creative fire. Photo: Olga Garcia. Credit: Weenobee.com. Major support for Readings/Workshops  events in California is provided by The James Irvine Foundation. Additional support comes from the Friends of Poets & Writers .